Our next instillation of Nourishing Traditions is coming to you! Read on!!! This post and what follows today closes the introduction and the start of the cookbook portion! We are making head way! 😉 Even if we are only on Page 81! However, I found the following quote in her closing words so true and important to remember. Food and the enjoyment of it is so vitally important to our family. We LOVE food! I know I’ve told others this before, but I probably only make a recipe twice a year! I don’t make things more than once very often. There are so many good combinations out there and so many good things to eat! I’m always on the hunt for new things to try and new ideas to excite me about cooking! I would have no desire to eat healthy if it didn’t taste good! That is the desire I have as I post recipes on this blog… that they are healthy and TASTY! Fallon also states that it is important to satisfy the four tastes we have been created with: Salt, sour, bitter and sweet. All of these flavors can easily be found and enjoyed in natural foods. This section was hugely helpful to me. Most categories of foods are divided into groups: Nourishing Traditional Foods, Compromise Foods and Newfangled Foods. After all that I’ve read and studied it is hard to remember highly beneficial and what is just OK. It isn’t too hard to remember what she really says to stay away from. She has a way or writing that makes you WANT to avoid those things at all costs! What she says about them makes so much sense. Below I’ve included some of the items she lists in these three categories. Not nearly all of them and without the explanations and clarifications she gives, but it at least gives you the idea of the content she supplies. Nourishing Traditional Foods: Raw milk, butter and cheese, grass-fed meats, organic whole grains fermented legumes, soaked nuts and seeds, fermented drinks and unrefined sea salt. Compromise Foods: Commercially raised meats, small amounts of tofu, milk from commercial dairies, melted cheeses, white flours, veggies from a distance, natural sweeteners, honey, maple syrup, rapadura, wine and beer. Newfangled Foods: Processed meats like luncheon meats and salami, processed oils, pasteurized or homogenized dairy,bleached and fortified white flour, commercial dry cereals, corn syrup, irradiated foods, soda alcohol, coffee, tea, MSG, artificial flavors and additives or colors and aspartame. Now this is my Christmas wish list! It was encouraging to go down through the list and see how many changes I’ve made over the last few years to healthier kitchen equipment. It also made me see quite a few more items I’d like to add to my arsenal! Again… not necessities, but definitely wants! Of course we shouldn’t be surprised that she highly recommended getting rid of the microwave, but I was surprised about the pressure cooker. I don’t have one, so I don’t have to worry about it, but I was thinking of getting one. I’ve heard they do great for quickly cooking dried beans. Fallon says they cook foods at unnaturally high temperatures which damages and removes the nutrients in the food. The following is a new wish list of items after reading this section! 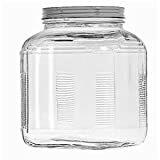 [amazon_link id=”B0000DDWOI” target=”_blank” container=”” container_class=”” ] [/amazon_link]Glass jars – I especially want more gallon sized ones to store my bulk purchases in! 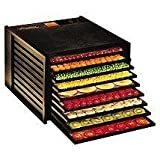 [amazon_link id=”B000I6MXZG” target=”_blank” container=”” container_class=”” ] [/amazon_link]Dehydrator – I love mine, but I’m afraid it is going to die any day. I dream of owning an Excalibur! This section had a lot of great ideas and tips to make working in the kitchen easier and to save time. It also had a few natural remedy ideas too… like how to get stains out of aprons, remove tomato skins and what kind of butter to use. The first of the two tips I found most interesting and useful for me were to soak veggies in hydrogen peroxide for 10 minutes to remove chemicals and pesticides. I need to find a good way to add this to my routine. I know a water rinse doesn’t do it, but that is all I’ve been doing at the moment. The other comment was about dishwasher powder. She says it is extremely poisonous. She recommends only using half of what the box suggests and to run an extra rinse cycle. Also if anyone has cancer in the home, their dishes should be hand washed and rinsed well. There is a lot of additional information, hints and tips… some of which I knew and some I found revolutionary! I hope you get the chance to read it!